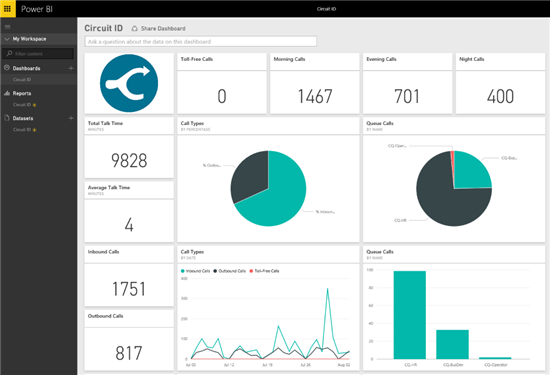 We’re excited to announce that this week’s update to Power BI now offers Circuit ID users the ability to track and monitor all their Circuit ID cloud communications services, empowering them to make the right business decisions. 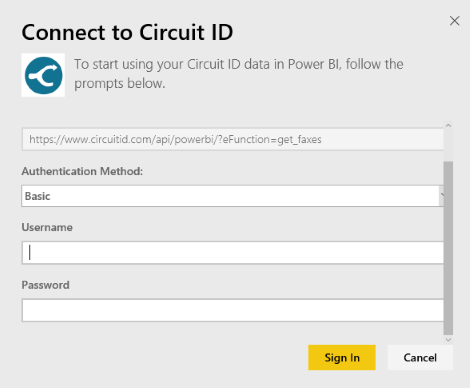 This post describes how the Circuit ID Power BI content pack helps you explore your Circuit ID data. For additional details on how to get started, please see the Circuit ID content pack for Power BI help page. 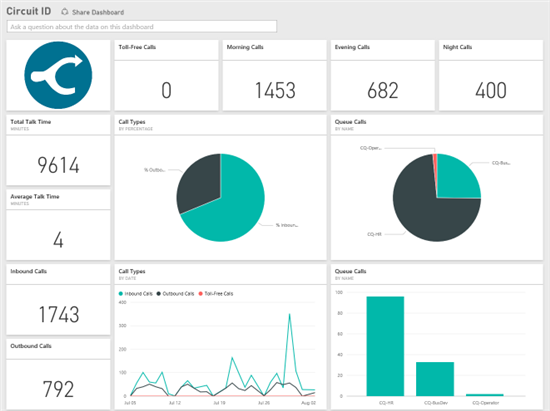 The content pack brings in data about your calls and messages, allowing you to track insights like the amount of calls per time of the day, types of calls, talk time, the amount of calls and messages that occurred over time and much more. To connect, simply use your Circuit ID credentials. Make sure you select “Basic” as the authentication method (as in the picture below). 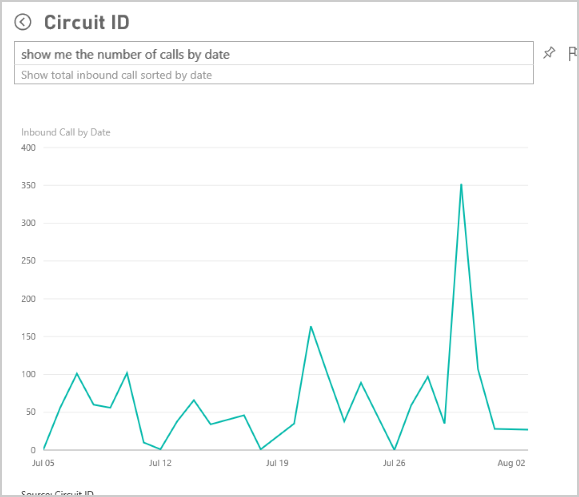 Once connected, a curated dashboard and report will be created for you showing insights right from your data. You can customize these dashboard and report or create your own new ones. The report contains multiple slides with different views that allows you to explore more details about your calls and messages. The dashboard has a curated set of visuals that allows you to monitor your data and helps you make business decisions based on it. The data will refresh daily so you are always seeing an up to date view of your data. You can also use the question box above the dashboard to explore the data by asking natural language questions. Try asking a question such as “What is the number of morning calls done last month?” or “Show me the number of calls by date”. We hope you find this new integration helpful to your business scenarios. We’re always interested in hearing your feedback – please contact us at http://support.powerbi.com to let the team know how your experience was and if there’s anything we can do better. We look forward to your feedback! Power BI ile ilgili son haberleri doğrudan gelen kutunuzda almak için aşağıda kaydolun! Hemen kaydolun ifadesini tıklayarak Microsoft’a Power BI bülten programıyla size, özel haberleri, anketleri, ipuçlarını, önerileri ve Power BI’dan en iyi şekilde yararlanmanıza yönelik diğer bilgileri gönderme izni vermiş olursunuz. Aboneliği dilediğiniz zaman kaldırabilirsiniz. Microsoft Gizlilik Bildirimi. Power BI, verileri analiz edip öngörü paylaşmaya yönelik iş analizi araçlarından oluşan bir pakettir. Her aygıtta kullanılabilen zengin panolarla işinizi izleyin ve yanıtlara hızlıca ulaşın.